Brilliant and beautiful, Holbein Artists' Watercolor Half Pans have been created for artists who enjoy painting anywhere and everywhere. Made with a combination of both traditional and modern pigments, these watercolors offer exceptional brilliance, excellent lightfastness, and crisp, clean results without muddiness. Like Holbein Artists' Watercolor Tubes, this line contains many exceptional and brilliant colors that are not found in other watercolor lines. They do not contain ox gall or any other dispersants that inhibit optimum brush handling qualities. Holbein Artists' Watercolor Half Pans are specially formulated to offer the highest possible concentration of pigment while still remaining easily rewettable. 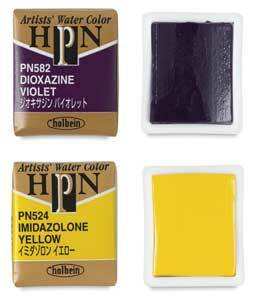 Set of 18 — A durable, high-quality plastic case contains 18 Holbein half pan colors including Brilliant Orange, Burnt Sienna, Burnt Umber, Chinese White, Lemon Yellow, Payne's Grey, Prussian Blue, Sap Green, Ultramarine Deep, Viridian Hue, Yellow Ochre, Dioxazine Violet, Indian Yellow, Opera, Cadmium Green Pale, Permanent Alizarin Crimson, Cadmium Red Light, and Cerulean Blue, along with a travel brush. Palm Box Set of 12 — Carry this Palm Box in your bag or backpack, and you'll be ready to paint whenever inspiration strikes! It includes Burnt Sienna, Burnt Umber, Ivory Black, Prussian Blue, Sap Green, Vermilion Hue, Viridian Hue, Yellow Ochre, Dioxazine Violet, Imidazolone Yellow, Permanent Alizarin Crimson, and Cobalt Blue Pale in a high-quality plastic travel case built for many years of use. Set of 24 — This set contains 24 half pan colors including Brilliant Orange, Burnt Sienna, Burnt Umber, Chinese White, Lemon Yellow, Olive Green, Payne's Grey, Prussian Blue, Sap Green, Ultramarine Deep, Vermilion Hue, Viridian Hue, Yellow Ochre, Dioxazine Violet, Imidazolone Brown, Indian Yellow, Opera, Pyrrol Red, Cadmium Green Pale, Cadmium Yellow Deep, Permanent Alizarin Crimson, Shadow Green, Cerulean Blue, and Cobalt Blue Pale. They come with a travel brush in a durable plastic case that includes a 10 slot mixing tray. Palm Box Set of 36 — This set includes a broad range of Holbein Artists' Watercolor Half Pans and a travel brush in a durable plastic case with a built-in 10 slot mixing tray. The colors include Brilliant Orange, Burnt Sienna, Burnt Umber, Carmine, Chinese White, Indian Red, Ivory Black, Lemon Yellow, Olive Green, Payne's Grey, Prussian Blue, Sap Green, Sepia, Ultramarine Deep, Ultramarine Light, Vermilion Hue, Viridian Hue, Yellow Ochre, Dioxazine Violet, Emerald Green Nova, Imidazolone Brown, Indian Yellow, Leaf Green, Naphthol Red, Opera, Phthalocyanine Blue, Pyrrol Red, Quinacridone Magenta, Cadmium Green Pale, Cadmium Yellow Deep, Cadmium Yellow Lemon, Imidazolone Yellow, Permanent Alizarin Crimson, Shadow Green, Cerulean Blue, and Cobalt Blue Pale.